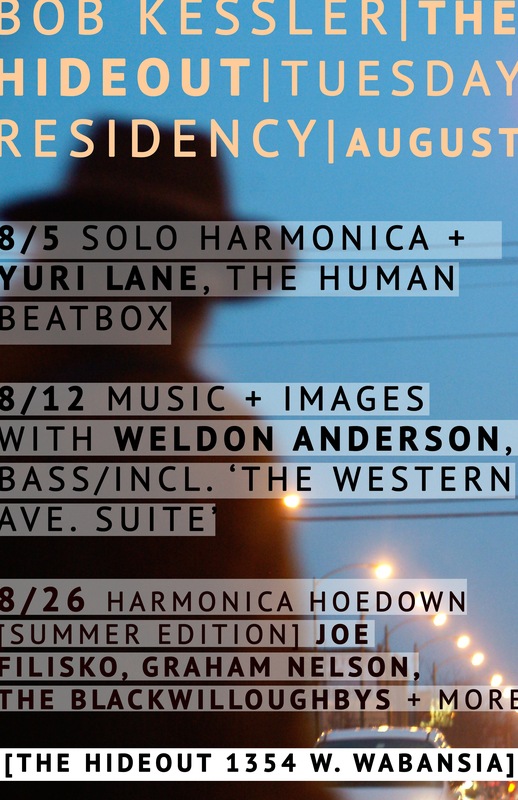 Thanks to all who attended the August residency at the Hideout. As H/O owner/manager Tim Tutten and I were talking about before the first performance, the series is to allow Hideout regulars (such as myself) who might have played the club before as a sideman but want to try out some news ideas. And, there were many ideas…solo looping on original pieces, new arrangements of pieces by great artists I admire, performances with projected images, plus working with dynamic duet partners like Yuri Lane (the Human Beatbox), the wonderful, soulful Weldon Anderson whose support and friendship helped me shape each evening. Not to mention old friends like Joe Filisko, Graham Nelson and the BlackWilloughbys. Thanks to all who accompanied on stage and in the audience!